‘Hey Joe’ has been arranged here for intermediate (Grade 3/4) level guitarists. This simplified arrangement of the classic Hendrix piece includes; hammer-on’s, pull-off’s, partial chords, open chords, barre chords, double stops, octaves and a walking bass line. The original contains a whole lot more… and the guitar is tuned a semitone down from standard tuning. This is the simplified version using standard tuning. Press the tip your first finger down at the third fret of the second string, making sure you’re not touching the first string. Pick downwards to sound both the second string and the open first string. Now hammer-on and pull-off the fifth fret of the second string with your third finger. Keep your first in place and put your second finger at the fourth fret of the third string. Play these two notes together and slide them down two frets, then pull them off to sound the open strings. Next, an open E chord is played in two parts. First the lower strings are strummed then the higher ones. The third bar uses pairs of notes. Theses are octaves that slide up one fret (a semitone). This bar ends with another open E chord. The final bar of the intro has a repeated phrase that starts with a hammer-on between frets seven and nine of the fourth string. 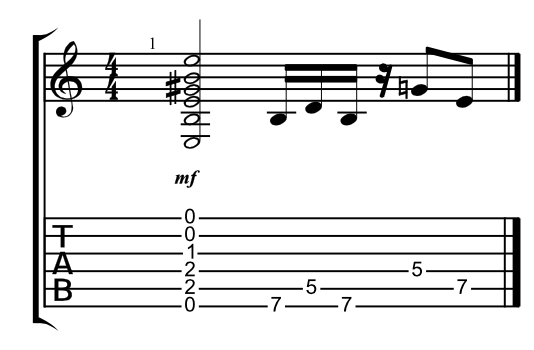 This is followed by a double stop (pair of notes) at the seventh fret. This is the chord progression. The duration of each bar is for four even beats. In the first two bars each chord last for two beats. The E chord lasts for two bars (eight beats). These are the open chord shapes. Barre chords can also be used. These are the barre chord shapes. The final chord ‘E’ is played open. A riff replaces the final two beats of the E chord. This diagram shows the duration of each chord and tab for the barre chords. This part follows the chord progression with a walking bass line. The arpeggios (individual notes of each chord) are linked with chromatic (semitone) passing notes.